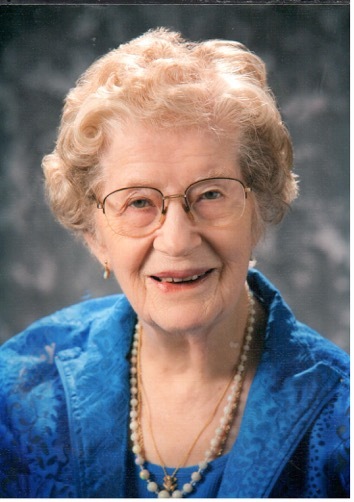 On February 7, 2019, Alice Helen Kushner (nee Lauxterman) passed peacefully surrounded by her loving family. She dearly Loved the Lord and now stands in His presence after waiting so many years to meet Him in person. Alice was born March 20, 1926 in Missouri the daughter of Edwin and Julie (nee Hanney) Lauxterman. Her family moved to Michigan, where she spent her childhood and college years. She met her husband, "Steve" Saul S. Kushner at The University of Michigan. They were married and moved to Maryland in 1963 where they would be together until Steve's passing in 2002. Alice worked as a teacher for Anne Arundel County working with deaf children, children with learning disabilities and serving as a Resource teacher for many years. After retirement, Alice volunteered with Hospice of the Chesapeake for many years. The friends she made there - Ora Lee, Anita, Sara, Mary, Fran, Carol, and Janet - were precious to her. Preceeding her in death are her parents, Edwin and Julia Lauxterman, her husband, Steve Kushner, and both of her (younger) siblings, Richard Lauxterman and Ruth Feiler. Alice is survived by her loving children,Janice Kushner of Azle, Texas, Monica and Dave Keen of Crownsville, Maryland, Jill and Jim Gallagher of Finksburg, Maryland, Jeffrey Kushner and his fiancee, Kerry, of Pasadena, Maryland, Larry Kushner and his fiancee, Sandy, of Bel Air, Maryland and her former daughter-in-law, Peggy Kushner, of Severna Park, Maryland. Also surviving are 12 beloved grandchildren, Padraic Keen, Trevor Keen, and Coleen Keen, Ann DiMaggio (her late husband Kevin) of Littlestown, PA, Lisa Wright and her husband, Korey, of Houston, TX , Trey Gallagher and wife, Jessey, of Stafford, VA , Chris Gallagher and his wife, Annie, of Westminster, MD , Hannah Gallagher of Westminster, Maryland, Kristen Riley and her husband, Chris, of Baltimore, Maryland, Kyle Kushner of Severna Park, Maryland, Erin Kushner of Severna Park, Maryland and Steven Kushner and his fiancee, Kori, of Aberdeen, Maryland. As a teacher, one of Mom's passions was the education of disadvantaged children. The CURE Scholars Program admits a cohort of 25 students each year. The students, who come from the inner city, growing up in conditions you and I would find appalling, make a year-long commitment after their regular school to come to UMB and be trained and a wide variety of health care professions. They attend every Tuesday and Thursday afternoons and Saturday mornings at UMB from October through May and also summer school. The program is in its fourth here now. The retention rate of these students is 93%. They become exposed to nursing, vascular surgery, anesthesiology, epidimeology, technician work, shock trauma, view live surgery and have detailed homework assignments. Because they cannot attend our program unless they first attend regular school, the attendance rate is 100%. Their combined GPA has jumped from 1.9 to 3.4. UMB provides free mentors to each kid. By picking these children to come into the program in sixth grade, as opposed to 11th or 12th, UMB has the opportunity to positively impact and mold these kids over a longer period of time. . Now in it's fourth year, CURE Scholars is in the high school curriculum. The 6th graders who first came in are now in their freshman year of high school. Now not every child is going to be a brain surgeon. However their eyes and hopes have been significantly broadened because of an earlier exposure to the power of education to get out of poverty. We are working on an endowment that will recognize these kids, if they stay through the entire program through senior year in high school, with scholarship dollars for college. It is a highly efficient program. I would like anyone of Mom's friends and family..... so moved.... to have the option of making a donation in memory of Mom to the CURE Scholars program. Many of these students remind me of those same students mom taught when she was at Carver School for the Deaf. The parallels are striking. All donation amounts are welcomed. CURE Scholars is a remarkable mentoring program which engages and inspires young students towards prominent careers in the medical and academic professions. Please consider a donation "In Memoriam - Alice Kushner" in order for the family to be properly notified.